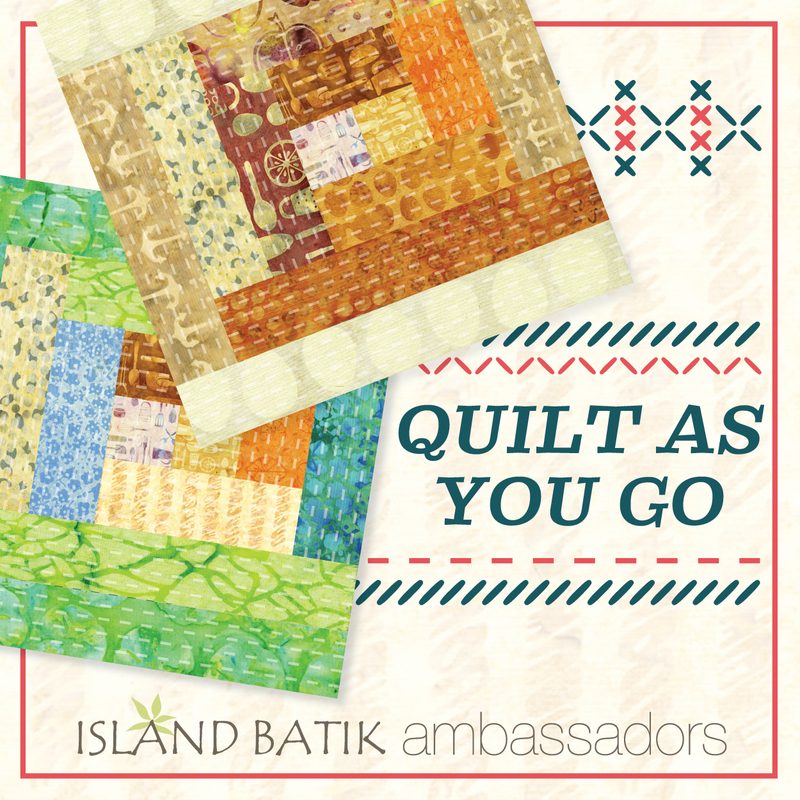 Where you layer the backing, batting and top and quilt each block one by one. As you can see, I've even stitched down my appliques using "QAYG". There are many ways to combine your blocks with "QAYG". My preference is with sashings. There are numerous tutorials on the web. A quick "Google" search will have you on your way. The background fabrics are from "Olivera" a new line of Island Batik fabrics. My "Island Batik" scrap bin held the secrets to creating these fun creatures. Oh, how I do love a good scrap bin!!! It got me to thinking about all the other "QAYG" projects I've done. Just why do I love it so much??? "Quiting Board". Did I bust the scraps. Bins and bins of scraps went into this one. This behemoth quilt is reversible and very heavy. Heavy enough that you will certainly not freeze if the furnace goes out in the winter! LOL!! The 120"x 120" size just would not fit on my long arm, so breaking it down into individual blocks, was the perfect solution. "A" ...It allows me to easily combine 2 quilts into one making it reversible, all while controlling both sides, block by block. This "International Sun Bonnet Sue" Quilt was put together using the "QAYG" method. It's my most popular quilt on "Pinterest". Being new to free motion quilting, it gave me a chance to play with a much more manageable size on my domestic machine. "B"...I have more control with free motion quilting, working on a smaller size. I use this method a lot since I only have a 10' frame on my long arm. It's just not quite big enough for the size quilts I like for my king size bed. '"C"...I can combine quilt styles and I don't have to buy a new frame for my longarm??? Eureka!!!!! "QAYG" gives me the flexibility to use up many fabric scraps as well as batting scraps. I'm all about getting a project out of leftovers from something else. I like to think if them as "freebie" projects! We all love that, don't we? Now, does this guy remind you of a watermelon or what??? He just wants to remind you, no matter if it's applique, string piecing, traditional piecing...the sky is the limit when it comes to "QAYG"! "Sew" think about your next project...Can you "QAYG" it? I bet you can! OH MY GOODNESS JOAN! Those quilts are so incredibly beautiful! The monster quilt would be so cute for a child. My grandsons would have loved it when they were small. Because of an injury to my neck, it is very hard to handle a whole quilt to get it quilted. I have been quilting mine row by row and then putting them together. Not so big, easier to handle But I do have a stack of blocks that I plan on doing with the Quilt As You Go method. Wow....you really do have that method down...amazing things you have done. THE ORCAS ON YOUR ORCA BAY!!!!!! How cool is that?! Love the Monsters.. very cool, and it's always nice to see the International Sunbonnet Sue.. along with all the other wonderful projects. I love scrap quilts to... I just think their is something special about them. Wonderful Joan. Your monster quilt is so cute! Thanks for the QAYG inspiration!! I can see you have really put QAYG tot he test and used it in so many different ways. Very impressive. really cute and fun to see the other projects too.